I mentioned last week about something I had traded for at my consignment store here in Salt Lake, Namedroppers. Well, here it is…this Alice and Olivia white lace skirt! I love it so much! Alice and Olivia is one of my favorite designers, and to find one of her skirts at a fraction of the price, and basically for free, because I had credits there, was so exciting! 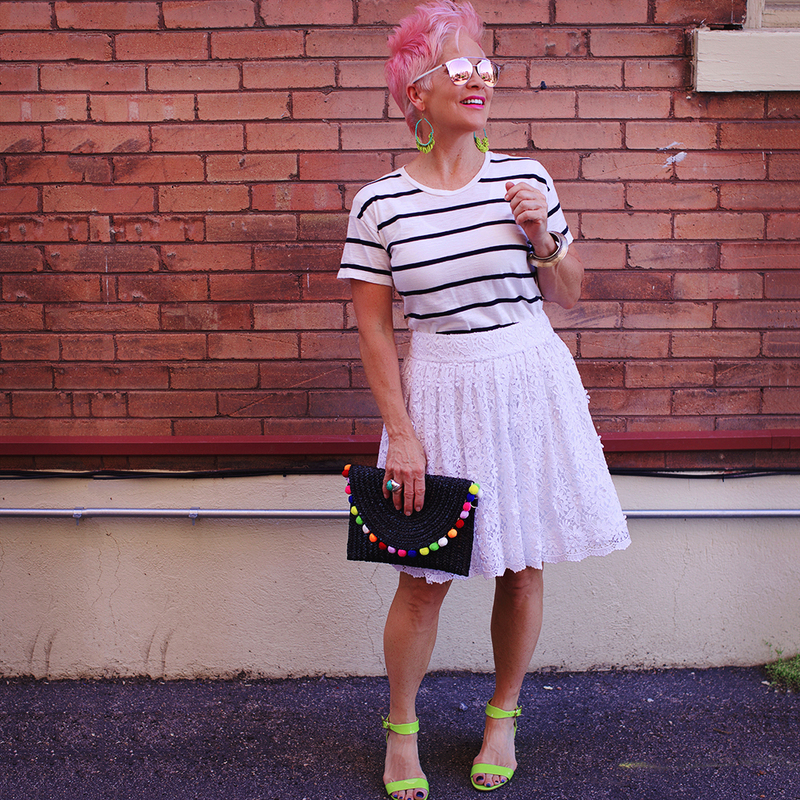 I’ve styled it two ways, one a tiny bit dressier….well maybe not! You really could wear it with a pair of Converse, but I couldn’t resist the florescent green sandals! This style of skirt on me is one of the most flattering. The knee length is great for summer and flats! All the cute mules and slides out right now, will look so cute with this! You can shop a similar look right here. And here are links to the second look! This skirt is THE CUTEST on you!! 😍 Love how you show us multiple ways to style the same piece. Love this outfit and love the two different ways to style it! You did great! Hi! New here. Found you on Pinterest and I adore your style. I just turned 51, have a ten year old and a two year old who I’m constantly chasing. It’s hard for me to even want to get dressed up sometimes. I used to love having fun with fashion and oh the shoes I had! I’ve settled into being just a mom and lost myself as a person with dreams and goals because I think I’m too old for any of that. Your blog is more than just about fashion, it’s helped me see that age really shouldn’t stop anyone from following dreams and pursuing new adventures and believing in yourself. Long story short, you’ve inspired me to “find myself” again which is not going to be an easy task but I certainly look forward to reading your blog. I want my children to see me as their inspiration to never give up and believe they can do great things at any age.